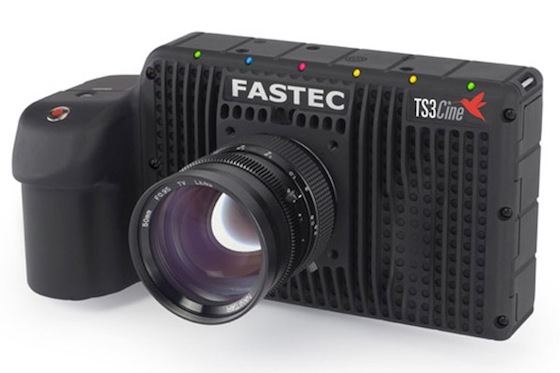 NAB this revealed some fantastic new gear, among them is the Fastec TS3 Cine. This camera coming to the market in late summer is a high speed portable self contained camera that shoots 720fps at 720P HD. The TS3 Cine manufactured by Fastec Imaging in San Diego and exclusively distributed in North America by Rule Boston Camera. This portable, battery-operated, high-speed camera with a unique and impressive 7” built-in LCD screen records 720p images at 720 frames per second. It includes the ability to record 1280 x 1024 at 500 fps, or up to 20,000 frames per second at reduced resolutions. Perfect for slow motion and it seems almost nothing is too fast. The Ts3 Cine comes in C-Mount, Nikon Mount and optional PL Mount for a variety of lensing options. It features a 3 hour removable battery pack allows you to keep shooting all day with only 2 batteries. This self-contained, handheld camera with easy and accessible menu system can also be remotely operated over Gigabit Ethernet or with a Wi-Fi USB dongle and web browser for long-distance control. Multiple storage options allow users to easily download to thumb drives, SDHC cards, portable hard drive, laptop, etc. The TS3Cine’s built-in 128GB solid-state drive (optional 256GB SSD) allows you to shoot all day without stopping to download to your laptop. The TS3 Cine is perfect compliment for action sports, promos, commercials, etc. Perfect for serendipitous high speed shooting with little to no set up required. Check out the camera in action with Tom Guilmette. Wow .. That’s great and informative .I really impressed from your blog and the topic of <a href=”http://www.fastecimaging.com/”>Fastec TS3</a>. Many people like and shared with one an other.Thanks for sharing this informative and great submission…….